On her sixth album, Nadler polishes an aural mirror of goth-tinged, gauzy folk ballads that reflect a world tarnished by loss, failed romance and the acidic hopefulness that often accompanies it, says Daniel Jones. Love is one of the oldest lyrical themes in music, and has been explored in essentially every form; from lust-ridden odes and apathetically anonymous “baby baby’s”, down into heartbreak and melancholic despair. Yet it’s one of the most primal emotions, able to entirely change the way we perceive the world with its presence… or absence. 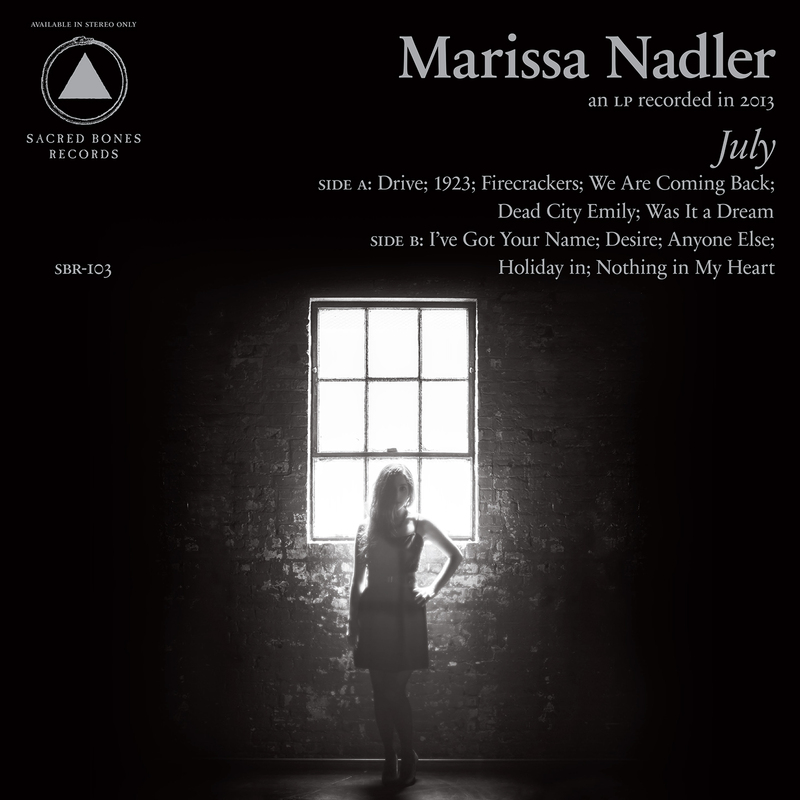 Love permeates every aspect of July, Marissa Nadler’s sixth album and her first on Sacred Bones, but it’s of the bittersweet variety—a tone that works well with her goth-tinged folk ballads, gauzy yet each with a powerful weight to them (no surprise, considering the album’s production duties were handled by Randall Dunn, whose studio work also includes essential names such as Wolves in the Throne Room, Sunn O))) and Earth). Over the course of the record, Nadler polishes an aural mirror that reflects a world tarnished by loss, failed romance and the acidic hopefulness that often accompanies it. As she examines each of these elements, she unravels them in her mind and knits them into new shapes that show the truth about loss: we place a heavy amount of nostalgia and overestimation on the things we lose, especially when the reality isn’t nearly as rose-tinted. July isn’t merely catharsis; Nadler isn’t describing how she managed to work her way past a shattered relationship. Instead, she details how it came about, the grief that followed, and how it became an integral part of her as a whole (though she would wish it otherwise). The distant memory of a drive with a lover, the songs from the radio spiraling around and infecting the atmosphere… stories within stories, adding their own elements to the mental tale. “Firecracker”, the story of the fourth of July confrontation with this lover that culminated in the loss of the relationship, is where the album really begins, as the question that it seems to be asking is, “When life as it is isn’t life the way you think it should be, how do you handle it?” When something that defines a large part of our world is taken away, our mental time frame becomes narrowed and disoriented—a form of rapid mental fatigue that causes us to make impulsive decisions. For Nadler, the answer is temporary escape, a return to something comforting—in this case, a childhood home, the walls and rooms imprinted with hopes and dreams from a time of innocence, when the worst hurts that the world could give hadn’t yet revealed themselves. In a moment when that world shows its dark face, the only things left for her are yet more memories. While it can sometimes be preferable to wallow in the black bile of our misery, allowing these same memories to bubble back to the surface time and time again, this mental flagellation eventually scours your youness away, replacing it with regret and false recollection repeated ad nauseum. In “Anyone Else”, she laments the fact that both of them could have been someone else’s better half, but still accepts that this person will never really disappear in her life: “Sometimes the night brings me back to you… and I look at the time spent wasted on you.” It might not be the healthiest approach to take, but it’s certainly a stronger one. Here, Nadler’s voice refracts and surrounds her, a choir of one; yet as beautiful as it sounds, there’s also insubstantiality to these ghost voices. “I have only myself,” she seems to say, but at that moment that’s all that matters—the knowledge that she has retained who she is, despite everything. That she persevered. July is out on February 4th via Sacred Bones. Stream it in full here.